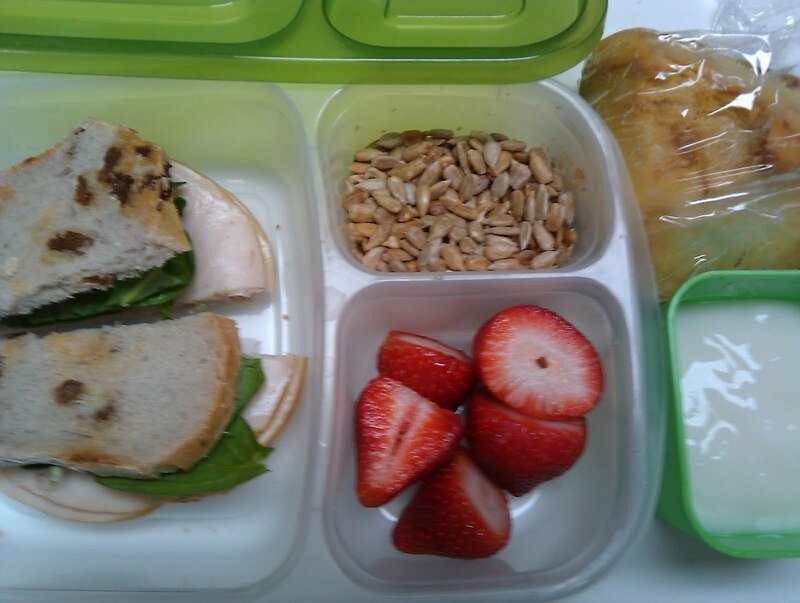 While I was at Mom Congress last week, my husband was charged with making our son’s lunches two days in a row. I was a little worried about how that would go, but I tried not to let it show. Of course my husband reads me like a book. My husband confessed that he was a little nervous too, but mostly about having enough time to prepare lunch in the morning by himself. My husband exceeded my wildest expectations. Impressive! The mochi (strange blob on the top) is something we picked up at Whole Foods. It’s Grainaissance Mochi (packaged, bake at home). I didn’t get a chance to taste it since I was out of town when he baked it, but if you are expecting authentic Japanese mochi, this is different according to my husband. My son liked it. A few years ago we were introduced to mochi after some friends visited Japan and told us of their many mochi binges. You can only find it at Asian food stores and so we don’t get it very often (now that I’m gluten free, not sure I can do them anymore). Mochi is to die for! So my husband did great here. He forgot fruit, but this is a great lunch. 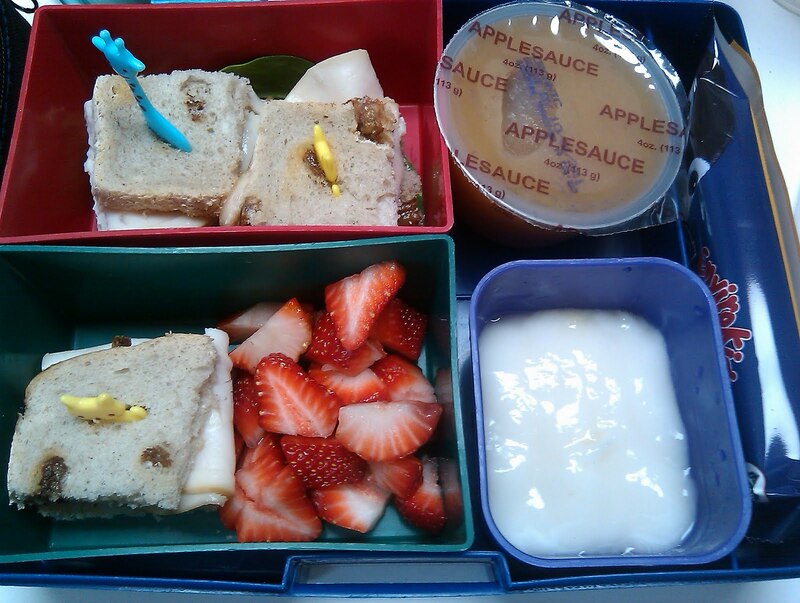 Day care menu: Soynut butter and jelly sandwich, mandarin oranges, peas with fruit and ice cream as snacks. 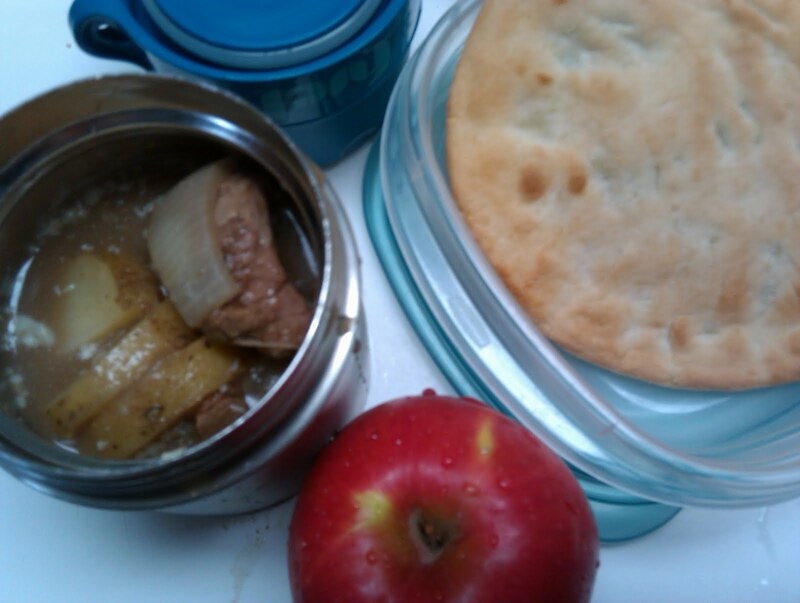 Another terrific lunch packed by Daddy. I love that you can see my husband’s plaid shirt on the bottom and some fun finger puppets. I know my hubby and little boy were having fun! Day care menu: Egg patty on bread, bananas, green beans with yogurt and pretzels with cream cheese as snacks. He loves mini-sandwiches! 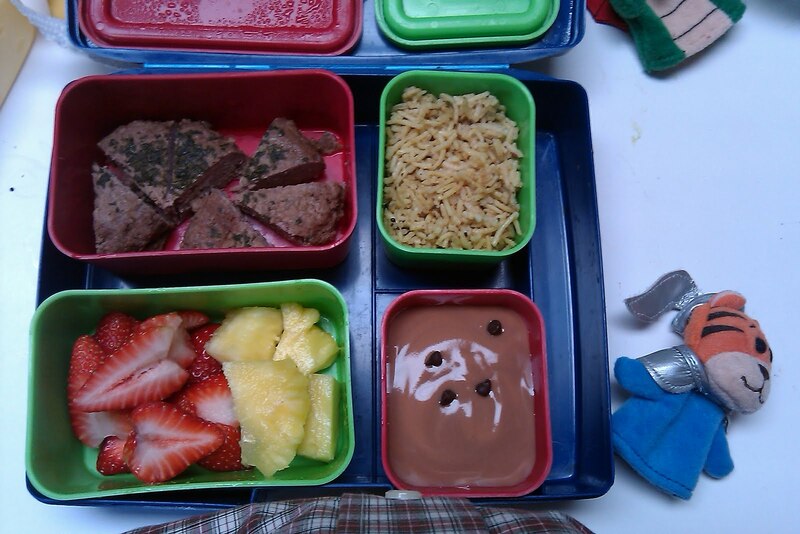 Day care menu: Ground beef and rice, diced pears, diced carrots, with fruit and yogurt as snacks. This was a hit lunch with my son. Day care menu: Chicken patty on wheat bread, applesauce, peas with fruit and blueberry muffins (the mini-otis-spunkemeyer junk version) as snacks. For dinner the previous night we ate crockpot beef stew. It was a really cold night so it was perfect. Our son wasn’t that crazy about it so I didn’t want to give him too much in his lunch. Plus the menu item was “cod nuggets,” which he likes. So I sent a compromise lunch. 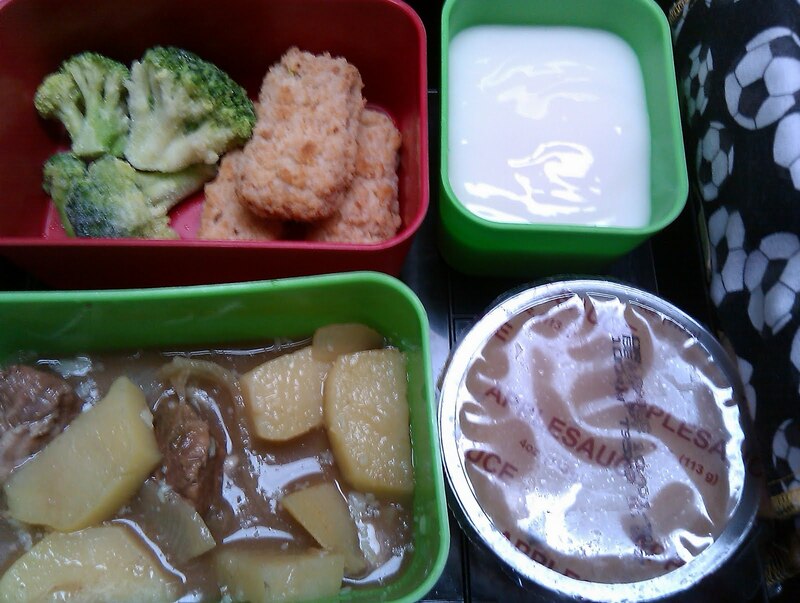 Day care menu: Cod nuggets, chicken and rice soup, diced peaches, baked beans with yogurt and fruit as snacks. I sat here and puzzled over what was in that bag (top right) — I couldn’t remember. I literally sat here for ten minutes trying to remember what that was. It was baked squash! Just so you know, I didn’t eat it. I opened my lunch bag and tossed it. It was not appealing! 🙂 Thankfully everything else was good. I know I need to do better in the veggie department. 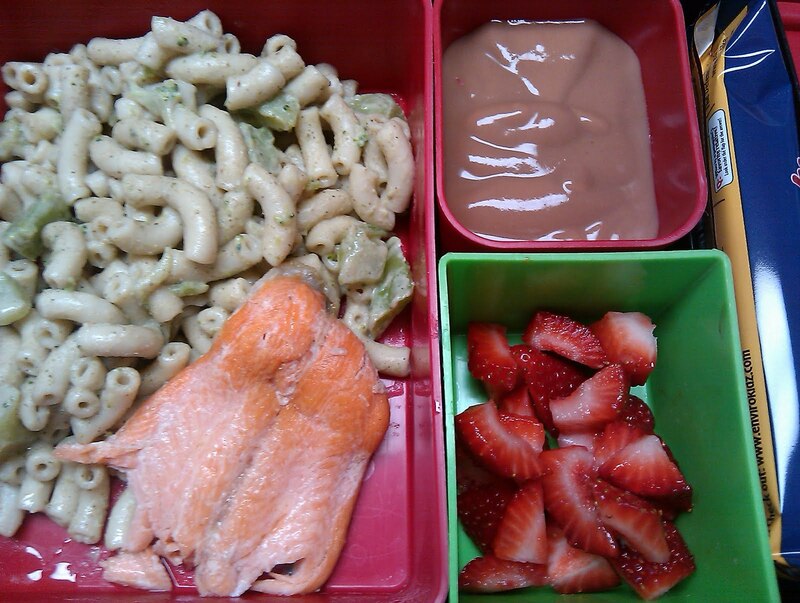 This whole lunch was thrown together in five minutes. Gimme some comfort food on a cold day! Where/what brand is that gluten free pita and is it good?? Anonymous — Ha ha! Thanks. I'm sort of brain dead right now! Allison — I buy them from a gluten free bakery! Those lunches are fantastic! Your husband did a great job! You are an inspiration; I feel I pack nutritious lunches for my son but yours are leaps and bounds ahead of mine. If I ever packed him spinach he might disown me. Way to go, Mr. Q!! You are so supportive! "Egg patty on bread" on the daycare menu?? What in the world…? I can't believe they have ice cream as a snack at a day care, either. I'm glad you're sending proper lunches for your son! Maybe if more parents reject unhealthy menus, the food will be improved to appeal to health-conscious families. Mochi are made from glutinous rice but they do not have gluten in them. Glutinous rice is a bit of a misnomer as the rice does not have gluten. It is called that because the rice sticks together well. I have never seen mochi with gluten in them…. 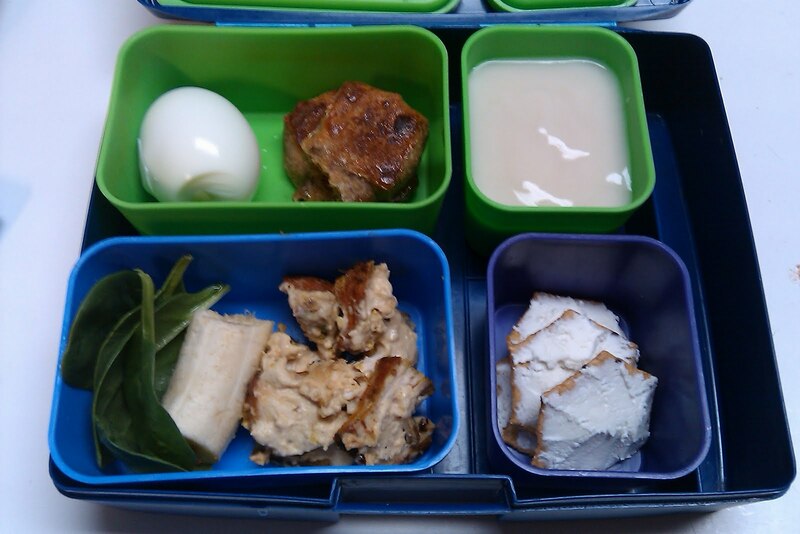 I stumbled onto your blog yesterday via a link from Just Bento. Your project of 2010 was amazing, your dedication, your awareness raising and your advocacy for what kids need. I spent hours reading yesterday and finished off this morning, your blog is riveting. Here in Australia we don't have school lunches as you do in the US or UK. You take your own or order from a school canteen, the canteen choices are pretty good health-wise. Congrats on all you have done. I spent twenty five years teaching so I know some of the things you speak of. I hope you have a great spring break and come back refreshed. 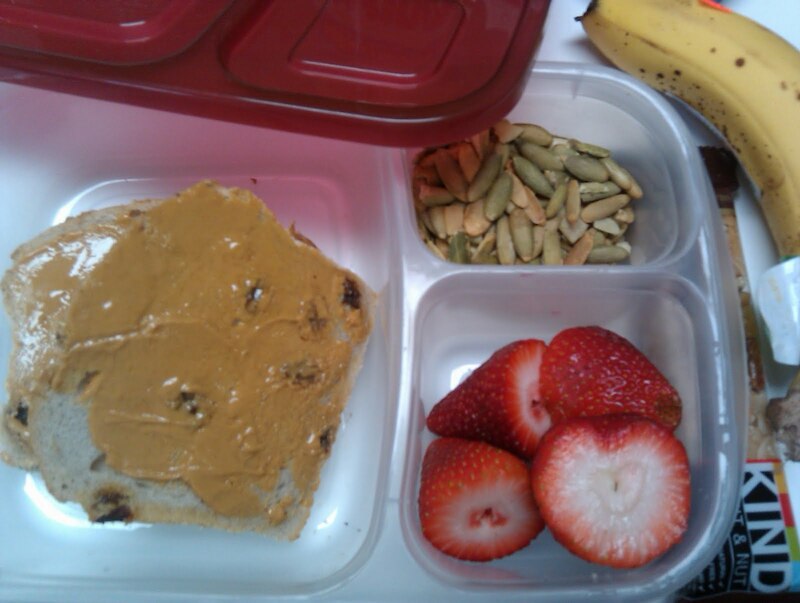 Honestly, I wouldnt eat half of what is in that kids lunch box….a lot of it looks pretty gross. That piece of salmon looks horrid and I LOVE salmon, lamburger?….yikes!! Good grief, Anonymous! For real? I'd let Mrs. Q pack my lunch any day. Mrs. Q- I ordered a lunch box from Laptop Lunches and it just came in! I am so excited that I totally might pack my lunch this summer, even though I'm not going to be working for a lot of it! I have absolutely loved reading your blog. I am 25 and it was fascinating to see things that occasionally resembled my own school lunches, and to see what has changed. Childhood nutrition is a huge passion of mine, because I am a nurse and I see how quickly you can ruin a perfectly good body on a daily basis. I am also incredibly thankful that my own mom was as intentional as she was about how she fed us, even though at the time I desperately wished for Pizza Lunchables haha. Anyway, thanks for doing this blog and your continued commitment to these issues. PS- I think your lunches look healthy, veggies or not. I just think of veggies as a dinner thing, even though I try to force them on myself for lunch too.